IPv6 – The New Internet? On June 6, World IPv6 Launch Day, some of the biggest sites on the internet – including Facebook, Google – permanently enable IPv6 – but what is it and how will it affect us? Internet Protocol Version 6 (IPv6) is the next generation of the Internet Protocol that is currently in various stages of deployment on the Internet. It was designed as a replacement for the current version, IPv4. In December 2008, despite marking its 10th anniversary as a Standards Track protocol, IPv6 still accounted for a minuscule fraction of the used addresses and the traffic in the publicly-accessible Internet which is still dominated by IPv4. 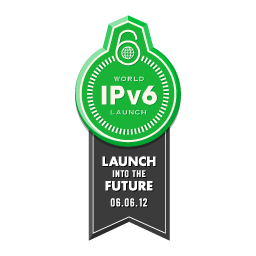 In a test run of the launch, on June 8, 2011 the Internet Society together with several other big companies and organizations held World IPv6 Day, a global 24 hour test of IPv6. IPv6 is the 2nd generation of IP addresses, developed back in 1994, to replace IPv4 when supplies ran out. IPv6 is often referred to as the “next generation Internet” because of its expanded capabilities and its growth through recent large scale deployments. IPv4 has been in use since 1982 and as is in the final stages of exhausting its unallocated address space. IPv6 addresses are 128-bits compared to just 32-bits for IPv4. This means that the pool of available IP addresses is much larger now than it ever was, allowing the internet to continue to expand and the industry to innovate. IPv6 supports about 340 undecillion addresses. IPv4 was the first version of the protocol to be widely adopted. However, at just 32-bits, the 4.3 billion available addresses don’t even give one address to each living person. IPv6 was developed to allow the internet to continue to grow at pace – almost infinitesimally as, at 128-bits, IPv6 provides an almost limitless supply of IP addresses. IPv6 has other advantages including its simplicity to configure, it is compatible with 3G wireless broadband and its support of more efficient broadband usage. How Will IPv6 affect me? As an end user, it is unlikely that you will see much impact from the switch to IPv6. However, as a website owner there are more factors to consider. IPv4 and IPv6 are essentially parallel networks so to exchange data between the two protocols requires special gateways. While most operating systems can support both, a lot of routers and servers don’t support it currently. The replacement of this hardware and corresponding software will obviously cost a lot of money which is why uptake of IPv6 has been slow.